An important aspect of Aztec religion and culture was the practice of human sacrifice. Human sacrifice had a long history in Mesoamerica, before the rise to prominence of the Aztec Empire. For example, there is archaeological evidence that both the Toltec and Teotihuacan practiced human sacrifice in the centuries before the Aztec Empire. 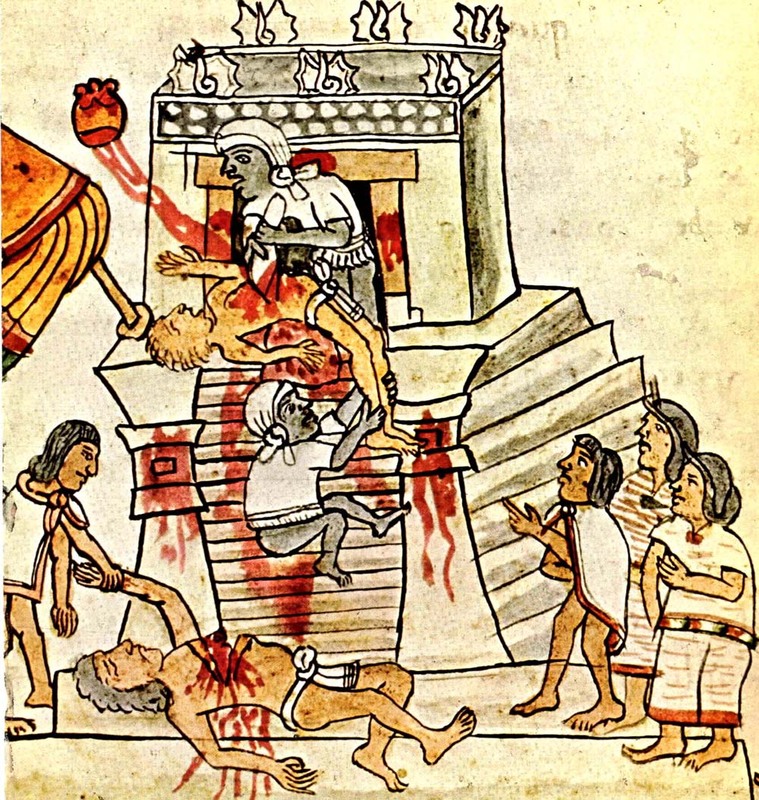 As such, historians consider human sacrifice to be a relatively common practice in Mesoamerica during years before and during the Aztec Empire. However, to the Spanish conquistadors that arrived in the Aztec territory in the early 1520s, the practice of human sacrifice carried out by the Aztecs was horrific and brutal. For example, several early accounts by these Spanish conquistadors highlight their horror to seeing festivals and ceremonies in which people were sacrificed atop Aztec temples and pyramids. In Tenochtitlan, the Aztec capital, sacrifices were carried out on top of the Templo Mayor (Great Pyramid of Tenochtitlan). For example, a first hand account of the Aztec sacrifice comes from Spanish conquistador Bernal Diaz del Castillo's famous memoir. He was a conquistador in the time of the Age of Exploration and accompanied Hernán Cortes on his famous mission to overthrow the Aztec Empire in 1521. In his memoir, Bernal Diaz del Castillo stated: "Hardly a day passed by that these people did not sacrifice from three to four, and even five Indians, tearing the hearts our of their bodies, to present them to the idols and smear blood on the walls of the temple. The arms and legs of these unfortunate beings were then cut off and devoured, just in the same way we should fetch meat from a butcher's shop and eat it: indeed I even believe that human flesh is exposed for sale cut up in their markets." Young man being sacrificed for Huitzilopochtli and Tezcatlipoca as part of the Toxcatl festival. From the Florentine Codex. Human sacrifice from the Codex Magliabechiano. However, from the perspective of the Aztec, sacrifice was necessary to ensure the survival of life. For instance, in Aztec religion, the world was created from the sacrifice of the gods. As such, they viewed sacrifice as necessary to repay their debts to the gods. Therefore, sacrifice did not necessarily just focus on human beings, as both animals and precious objects were also offered to the gods. Further to this idea, some historians have suggested that the Aztec practice of sacrifice was designed to protect and ensure the survival of the universe. This concept is best related to the Aztec god Huitzilopochtli, who was one of the main gods of the Aztec and likely the most prominent. 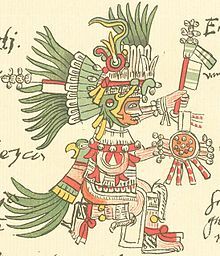 In Aztec tradition Huitzilopochtli was viewed as the sun, his sister the moon, and his brothers the stars. The constant movement of the sun, moon and stars was viewed by the Aztecs as an ongoing battle between Huitzilopochtli and his siblings. Thus, the Aztec believed that they needed to provide tribute to Huitzilopochtli in order to ensure the sun’s survival and ability to ‘fight’ each day. This tribute was usually in the form of human sacrifice, which was a central component of Aztec religious practices. This is because human blood was viewed as necessary for the survival of the gods. Tribute for Huitzilopochtli generally occurred on a festival called Toxcatl which was held in the 15th month of the Aztec calendar. In general, warriors or slaves were sacrificed to honor Huitzilopochtli. Therefore, to the Aztec people sacrifice was an important and necessary aspect of life to ensure the survival of the world and universe. There were regular festivals and sacrifices to other Aztec gods throughout the timeline of the Aztec calendar. The Aztec obtained the people for sacrifice in a number of different ways. Some were willingly sacrificed while others were prisoners in war. 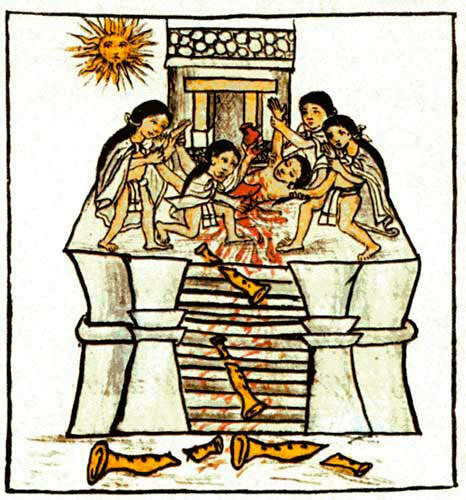 Regardless, the Aztec (and other Mesoamerican societies) viewed dying for the gods to be an honor. Following the Aztec’s founding and construction of Tenochtitlan in the Valley of Mexico in 1325, they quickly established their authority across the other societies in the valley. At the time the Valley of Mexico was populated by many different powerful civilizations, including: Chalco, Tepanec, Tlacopan, Texcoco, Culhuacan, and Chichimec. Several of these civilizations were also on the shores of Lake Texcoco, including the Culhuacan which were on the south shore. The Aztec controlled many of these different societies by forcing them to provide tributes for payment and ritual sacrifice. 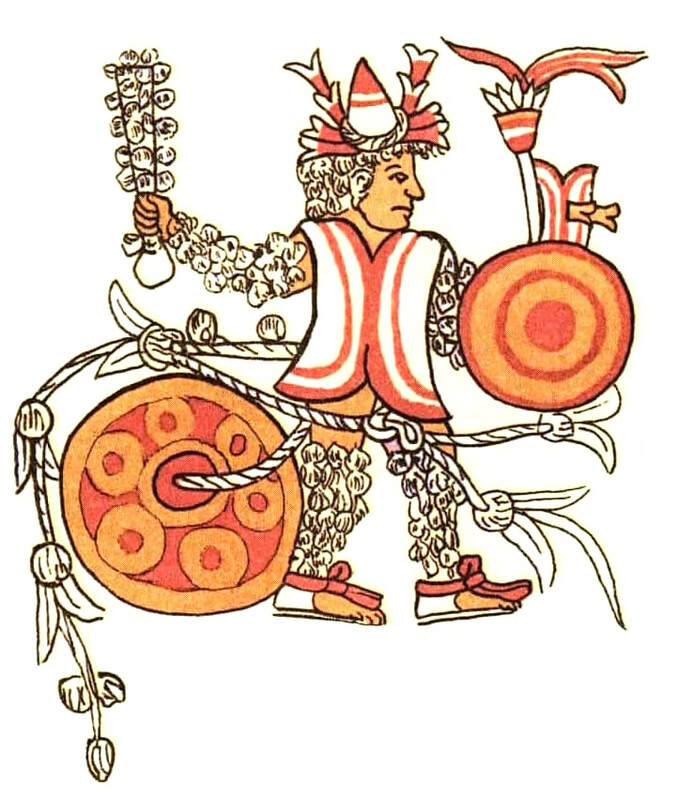 For example, conquered city-states, which are referred to as ‘altepetl’, were allowed to maintain their current rulers and religion so long as they met several requirements, including: support the Aztec Empire and tlatoani of Tenochtitlan, pay tribute to Tenochtitlan, and include the Aztec god Huitzilopochtli in their own religious beliefs and practices. As such, the conquered Mesoamerican city-states likely supplied the Aztec with slaves to be used in sacrifice. ​This was one way in which the Aztec received people for their ritual sacrifice. Another way was from ritualized wars that the Aztec and other Mesoamerican societies participated in called Flower Wars. These battles occurred at different times of the year than the campaigns of conquest that the Aztec used to expand their empire and were much different in their intent. For example, the Flower Wars were generally organized battles in which members of the Triple Alliance including Aztecs faced off against rival city-states. The two sides would structure the battle such that each side has an equal number of warriors and used only close-combat weapons. The purpose of the Flower Wars was for warriors to practice and display their combat skills while also allowing them the ability to take prisoners for the purpose of sacrifice. A common participant of the Flower Wars was the Tlaxcala, who were a rival city-state to the Aztec. Historians believe the Flower Wars occurred primarily between 1450 and 1520 when Spanish conquistadors arrived into the region and famously overthrew the city of Tenochtitlan. Captured victim of combat, from Codex Magliabechiano. He is tied to a large stone and his macuahuitl weapon is covered with what appears to be feathers instead of obsidian. Tenochtitlan with the large pyramid (Templo Mayor) shown on the left. 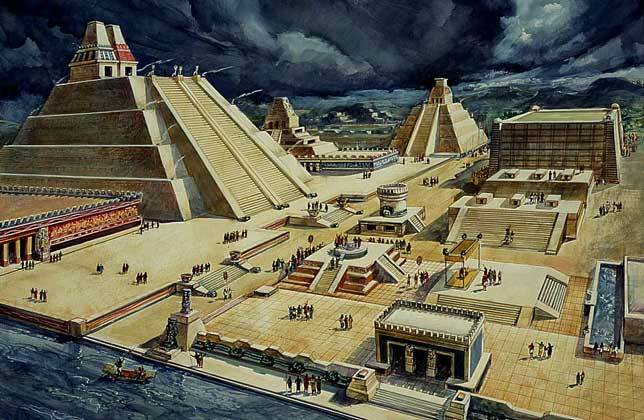 As stated previously, the actual sacrifice generally took place stop large temples or pyramids which the most prominent being the Templo Mayor in Tenochtitlan. It most commonly involved the removal of the heart of the sacrificed victim. There was even ornate structure built to hold the removed hearts during the ceremony. Once having their heart removed the body was thrown down the steps of the pyramid to the crowd below. With that said, the removal of the heart was not the only method of death in ritual sacrifice. Depending on the god being celebrated and the festival requirements, ritual sacrifice could also include: death by fire, death by starvation, death by flaying (removal of the skin), death in ritual battle, and death by decapitation (removal of the head). As well, who was sacrificed changed with each festival as well. Sometimes it involved adult slaves, other times children, or people of noble birth. As stated above, death by sacrifice was considered to be an honor as your death would be in tribute to the gods and maintain the survival of the universe. For example, during the festival of Panquetzaliztli, of which Huitzilopochtli was the patron, sacrificial victims were dressed in the manner of Huitzilopochtli's costume and blue body paint, before their hearts would be sacrificially removed. Those being sacrificed were treated as gods until their death. A final important concept related to ritual sacrifice is the idea of ‘bloodletting’. Some historians have suggested that bloodletting, causing yourself to bleed, was practiced throughout Mesoamerican and the Aztec Empire. The idea is that Aztec people purposefully caused themselves to bleed by puncturing their tongues or skin with sharp blades as a form of offering to the gods.